A supremely blissful divine yogini. She is the mansion of enlightened awareness. The sovereign of the mandala. The essence of ultimate reality. She is subtle and spacious and vast as the sky. 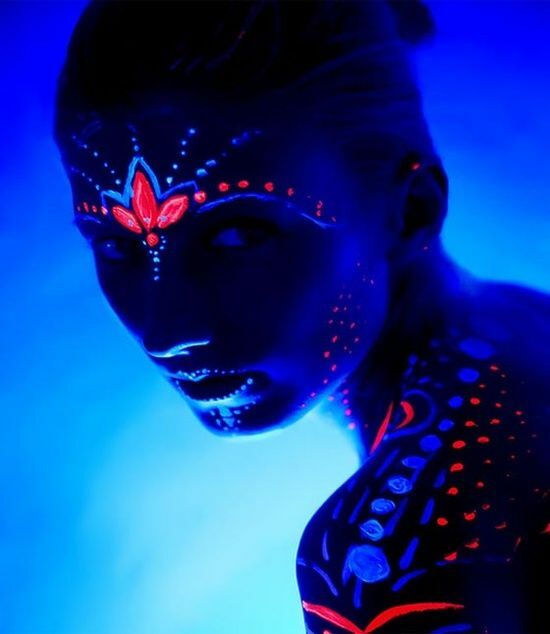 Her body is blue, the color of infinite space, reflecting the limitless expanse of her awareness. Separation is an illusion, in truth we are connected with all that exists in a vast web of communion. Swan Devi (Nairatmya) embodies this realization. She is the lady of emptiness. She who has realized selflessness. Like the element of space, she flows through the universe without impediment, for she has transcended ego-centered existence. To contemplate Swan Devi, is to behold the essence of ultimate reality, the infinite expanse of all that exists. The essence of ultimate reality is emptiness and bliss. She is deep blue in color, the indigo of midnight. She is draped with a skull necklace, bone ornaments, and a tiger skin skirt. Bearing a flaying knife, skull bowl, and tantric staff, she dances on an upward facing corpse on a moon disc. She has a fierce persona with furrowed brows, lolling eyes, bared incisors, lashing tongue, and upswept tawny hair. She transforms anger into mirrorlike clarity. The ferocity often attributed to female Buddhas also evinces the intensity of one who has faced and conquered all obstacles to enlightenment. The flaying knife is for cutting off mental and emotional defilement’s, and the skull bowl is the realization of emptiness, which is beyond being and nonbeing. From her skull cup she drinks the blood of the four mara-demons, symbolizing the primary forms of attachment to self. As a diamond sky dakini, she is identified with the mystical heat that is kindled in the navel chakra through inner yogic processes. She is known as the Burning One and described as ‘dwelling in the navel, source of supreme bliss, glorious, adorned with flames by virtue of her fiery heat.’ This inner yogic fire consumes delusion by rising upward along the spine, purifying the chakras of karmic residues of thought and emotion. Upon reaching the crown chakra, the heat causes the nectar of bliss in the crown of the head to melt and flow downward, generating increasing rapture and bliss, culminating in the supreme state of spontaneous joy when the nectar reaches and saturates the navel chakra. This internal fire is a yogic version of the apocalyptic conflagration that destroys the world at the end of every cosmic cycle so that it may begin anew. In both cases fire is the consuming element, reducing all things to an undifferentiated state, returning them to their essence. This essence – the one thing remaining at worlds end, the irreducible quality of the world that is realized upon enlightenment is bliss – ‘Bliss is the single self-existent, perfect and eternal.’ She is bliss supreme. Swan Devi translates into ‘purest form of knowledge (swan) from the goddess (devi)’.